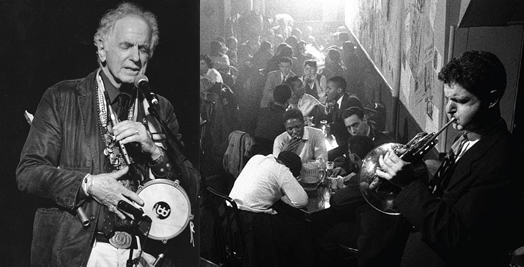 THE RENAISSANCE MAN: David Amram today (left) and back in 1957, jamming on French horn at the Five Spot in New York City. 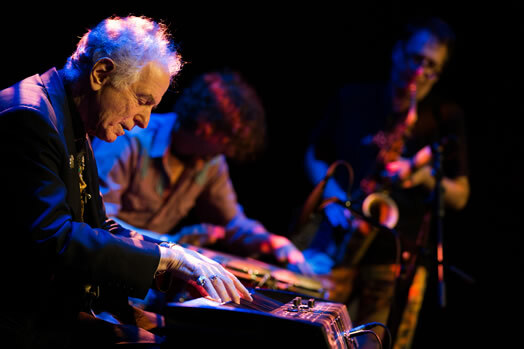 David Amram has played with everyone and traveled everywhere, but it’s never gone to his head. He started his professional life in music in the early 1950s playing French horn in the legendary jazz bands of Charles Mingus, Dizzy Gillespie and Lionel Hampton. Appointed by Leonard Bernstein as the first composer-in-residence for the New York Philharmonic in 1966, he also composed the scores for the films “Pull My Daisy” (1959), “Splendor in the Grass” (1960) and “The Manchurian Candidate” (1962). He composed the scores for Joseph Papp’s Shakespeare in the Park from 1956 to 1967 and again worked with Papp on the comic opera “Twelfth Night” in 1968. He wrote the opera “The Final Ingredient: An Opera of the Holocaust” for ABC in 1965. From 1964 to 1966, Amram was the composer and music director for the Lincoln Center Theatre and wrote the score for Arthur Miller’s play “After the Fall” in 1964. A prolific composer for over 50 years, his most recent symphonic compositions include “This Land: Symphonic Variations on a Song by Woody Guthrie” (2007), commissioned by the Guthrie Foundation and recently performed and recorded by the Colorado Symphony; “Giants of the Night” (2002), commissioned and premiered by flutist Sir James Galway; “Kokopeli: A Symphony in Three Movements” (1995) and “Three Songs: A Concerto for Piano and Orchestra” (2009). He has also collaborated as a composer with Elia Kazan, Eugene Ormandy, Langston Hughes and Jacques D’Amboise and as a musician with Thelonious Monk, Johnny Depp, Hunter S. Thompson, Odetta, Bob Dylan, Willie Nelson, Betty Carter, Floyd Red Crow Westerman, Arlo Guthrie, Pete Seeger, Paquito D’Rivera and Tito Puente. In 1957, he created and performed in the first-ever jazz/poetry readings in New York City with novelist Jack Kerouac, a close friend with whom Amram collaborated artistically for over a dozen years. Since the early 1950s, Amram has traveled the world extensively, working as a musician and a conductor in over 35 countries including Cuba, Kenya, Egypt, Pakistan, Israel, Latvia and China. He also regularly crisscrosses the United States as a featured performer at musical and literary festivals. In 2011, Amram was inducted into the Oklahoma Jazz Hall of Fame as recipient of the Jay McShann Lifetime Achievement Award. In 2013, he was presented with Clearwater’s Pete and Toshi Seeger Annual Power of Song Award. Last year, the Theatre for the New City honored him with its annual Love and Courage Award. Also in 2015, Brooklyn College gave Amram an honorary doctorate of fine arts and chose him as one of its commencement speakers. Last fall, there were a series of 85th birthday tributes to Amram all over the world. Today, Amram continues to perform as a guest conductor, soloist, multi-instrumentalist and narrator in five languages, while continuing a remarkable pace of composing. His current schedule is at www.DavidAmram.com. David Amram first joined Local 802 in 1956. Allegro editor Mikael Elsila recently sat down to talk with Amram about his life in music. 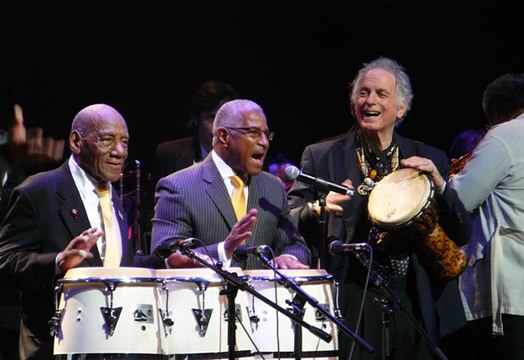 David Amram, as a featured guest with Bobby Sanabria’s orchestra, playing with Candido (left) and Felipe Luciano at the Apollo Theater in 2011 for a tribute to the legacy of Mario Bauza, the master of Afro-Cuban jazz. Allegro: You turned 85 last fall. Your life story has been extensively documented in books and films. Now you’re reaching out to younger musicians to help them grow as artists. When you look back at all the luminaries you associated or played with, what advice has helped you most that can help younger players? Allegro: You played “world music” before it was even known as a genre. You were one of the first Americans to perform in Cuba after the Cuban revolution, and you also traveled all over the world learning new musical traditions and even performing at folk festivals. All the time, you were an accomplished classical composer. What were the best parts of your travels to other lands, and what did you learn from your musical journeys outside of the United States? David Amram: My postgraduate work was in what I call the “University of Hangout-ology.” In other words, I hung out and traveled the world! My basic tuition in this school was simply learning how to say “Please,” “Thank you,” “That was beautiful,” “Can you play that again slower?” “Where is beat one?” and trying to figure out the scale or mode or structure. And then trying to be a grain of sand in the experience, stay in the background to be a part of it, and get enough of a sense of the feeling so that when you come back home, you can still hear it and feel it and learn it and make it a part of you. Any time I would end up using something traditional in a written-down piece for orchestra or chamber music, I would spend years learning one song or one pattern or one scale or one style from another culture, and then I always notate in the score who taught it to me, the name of it, and where I learned it, even if it was only a two-bar pattern. Copyright law says that snippet of folk music I used is public domain, but the laws of human decency are that when someone gives you a gift, you say thank you. It’s not that hard just to use those two words, which are also good to learn in English as well as all the other languages. And if you do that, then you’re being a gracious and decent person – a real musician and not a thief. And being a thief and a disreputable lowlife is already adding to an overcrowded field in the industry. In music, all of us are supposed to sacrifice some of our own egomania and narcissism and crazy behavior that we’re taught is supposed to show that you’re a “real leader” and try instead to become part of the whole. The great Native American musicians I’ve played with always said that the best leader is the best follower. That’s why when we conduct a symphony, you’re really told over and over by the musicians and also by the great conductors that you’re there to help out the situation, and if you know the music upside down and inside out, you can help out in certain times, and you can be of use when needed. The rest of the time, you can stay out of the way and try to create a good enough feeling to make everybody forget about you and get into that magical world of music. You get a whole bunch of people somehow all listening, playing with them, for one another. And then those incredible moments happen that no one can create, including a composer – and I know because I’m a composer myself. Some of the greatest moments in performances of my music by others is when the conductor allows the music to tell us what to do. If you can humble yourself, it’s amazing how much you can learn and how much you can develop and how much better you can feel about being in the world of music. Music can take you to places you’d never go, meeting people you’d never meet, and to countries where they might hate Americans, but since you brought your musical instrument, instead getting robbed and killed, you get invited for dinner. I’ll never forget watching CNN when the New York Philharmonic went over and performed in North Korea. You can see all the North Korean officials snarling at the cameras in hatred, and then when they finally ended up playing all that beautiful music – including a North Korean folk song – all those same people were smiling. That’s pretty powerful. Amram performing at the nightclub Le Poisson Rouge here in NYC. Allegro: How did you become someone without musical borders or walls in the tradition that Duke Ellington liked to call “beyond category”? David Amram: Well, to me, every musician, every person on earth has their own special priceless heritage or heritages. My interest is to learn more about things of beauty that touch my heart. So I don’t try to compose a universal, crossover, cookbook of slop. That’s what they call the “melting pot” – take everybody’s precious culture, put it in one gigantic pot, and come out with slop. Now there’s another way of looking at that, which I learned when I was in New Orleans as a teenager. I was told that the concept of gumbo is that everyone puts something in the pot. Each item is a nutritious element of its own. And then when the audience partake of that pot, they are nurtured by all of the other gifted people who contributed their element, and it is something that’s helpful and communal, to which you can make a contribution and from which you can be nourished. The “melting pot” is different – it means that everybody becomes the same basic insecure person. Another idea is the Canadian concept of the mosaic, where everyone is definitely Canadian, but they also have their own heritage or heritages that they brought with them when they came over. This includes a respect for the native people who were here thousands of years before any of us were lucky enough to come over here. And a lot of the problems that we see today are the result of thousands of years of bigotry and hatred and misunderstanding that preceded all of our collective experience today before any of us or our families even got over here. One of the wonderful things about the city, about New York City and Local 802, is that you can go to Queens where there are over a hundred languages spoken, and you can walk around the streets of New York City and it’s like traveling around the world. And once you’ve traveled around the world and continue to travel around the world, you can see that beautiful part of New York and feel more at home than ever because you realize through music, you can be at home around the world. Allegro: You’re one of the endorsers of Local 802’s Justice for Jazz Artists campaign. Why is important that society gives justice for jazz artists and that jazz artists get respect? David Amram: Because jazz artists make the whole world a more beautiful, exciting and creative place. Every time they play, it’s a very special, one-time-only artistic experience. If you don’t know what’s going to happen and you’re dealing with the moment, that’s the most important thing you could ever do in your everyday life. You know, the sink-or-swim reality of life is personified in jazz, and improvisation is something that will bring back creativity in everybody, whether they’re playing an instrument or just dealing with life every day. And spontaneity is the key to mental, spiritual and physical health. Allegro: How has the musicians’ union helped you during your career? David Amram: When I was in my 20s, I knew that old people existed but I never thought I would become one myself. I was told most of my life that my chosen career of music was a death wish. I always encourage everybody to follow their career death wishes to the max, because you can have a great life even if you’re at the edge of bankruptcy most of the time. But now, I appreciate the pension that I get from the musicians’ union. It helps me now, but when I was young I never dreamed that I would even live long enough to get it or that I would need it. It’s nice to know that you can get paid for your work and you have someone behind you. The wonderful thing about doing work through the union is that they will make sure that everybody gets paid. Allegro: What are you most proud of as a musician? David Amram: I would say first of all, my three children, Alana, Adira and Adam, all of whom were brought up hearing and being with many of those musicians and people we’ve already mentioned, and who rather than rebelling against me and becoming brain surgeons or hedge fund operators, all have their own bands, and they all play their own type of music and sometimes play with me. And secondly, I’m proud that I’ve been able to follow my heart and do what I love to do. I chose the long, nearly impossible road that I’m still on. I’m happy every time I leave the house that I can go out and do that, whether I’m playing at a folk festival or conducting a symphony or writing a new classical piece or accompanying a poet or learning a new genre of music with a bunch of people. My hope is that I can encourage other people not to copy what I’ve done, but to do what they feel they were put here to do and not to be discouraged. Realize that what you do to pay your rent vs. your value as an artist have nothing to do with one another. And we all have a song in our heart. We all have a story to tell. We all have a precious heritage, and we should all celebrate that and respect other peoples. Then you don’t need a guru or a psychiatrist or a career counselor or a dope dealer in order to feel good. That comes for free.